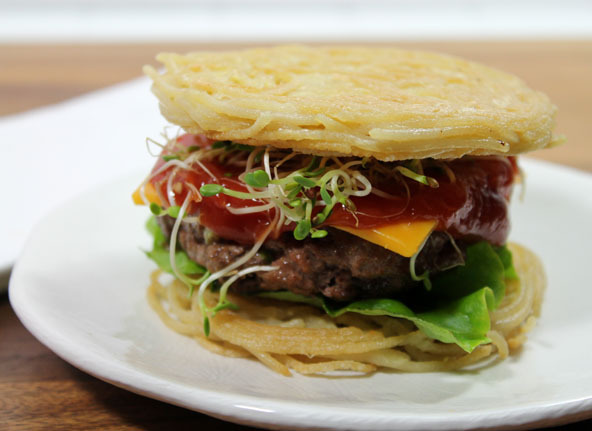 A healthier “Whole and Gluten-free” alternative to the buns used for the trendy "Ramen Burger"
If you haven’t heard of the Ramen Burger yet, you soon will. It was developed by Keizo Shimamoto who travels coast to coast selling his creative burgers to long lines of anxiously awaiting customers. It was a recent wowzer at this years Chicago Food Film Festival, November, 2013. Check it out in the news here. Rather than wait for the famous burger to reach my neck of the woods, I decided to make my own and see what all the hoopla was about. As a Wholetarian I’m certainly not into eating highly processed Ramen even if the MSG laden seasoning packet is not used in his famous culinary novelty– at least I hope it’s not! So I opted for using whole brown rice noodles (ingredients: organic brown rice) and went to work. Was it any good? My kids and husband sure thought so. I liked it, especially since I stay away from wheat nowadays (even whole wheat) and I must say it does make a nice gluten-free whole grain bun whenever you really want one. I had these 4 stackable moon pie pans- just perfect for the project. The moon pie pans nested together perfectly for pressing the noodles together while chilling in the refrigerator for 1/2 hour or more. 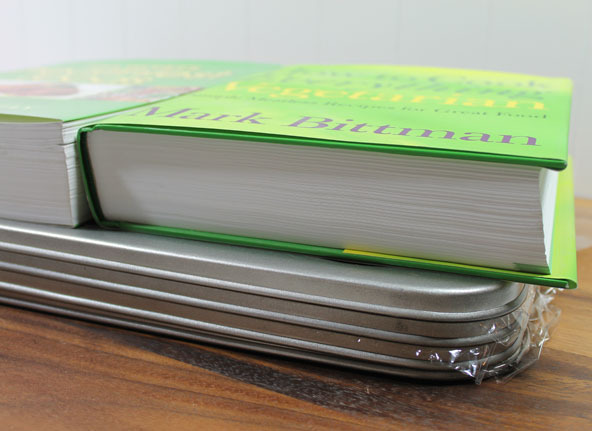 I used two heavy cookbooks to help press them together. It also works by putting them in the freezer for 15 min without the books. I suppose you could use cans to press down if you only have one moon pie pan. 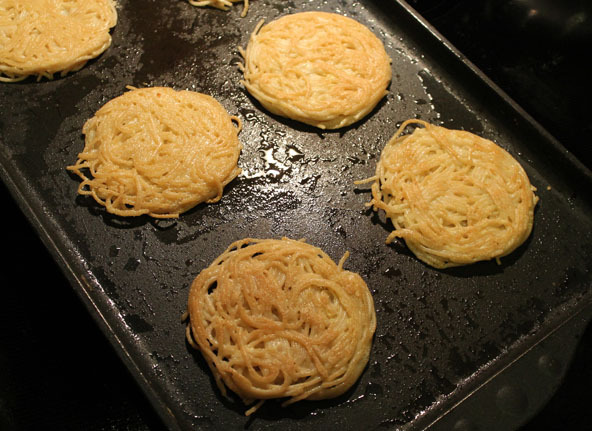 Using coconut oil or ghee, cook the noodle buns on a skillet until golden brown. Be sure to wait to flip them over only when they are stiff enough to turn over without falling apart. I broke the noodles in half (out of habit) before putting in the boiling pot to cook. Since then I never break the noodles so they will stay together better without as many loose ends as shown here. I tried making these with Shiratake noodles, Miracle Noodles or No Oodles– all made with calorie free, gluten-free white yams. It didin’t work well at all!!! These noodles do not have the stick-to-it-tivness that the rice noodles do. Shiratake noodles just will not stick together at all! You can use Shiratake noodles with my Orange-Glazed Tempeh but not for these “noodle buns” so don’t even think about it. This recipes uses 4 stackable Moon Pie pans with 6 pie indents each. 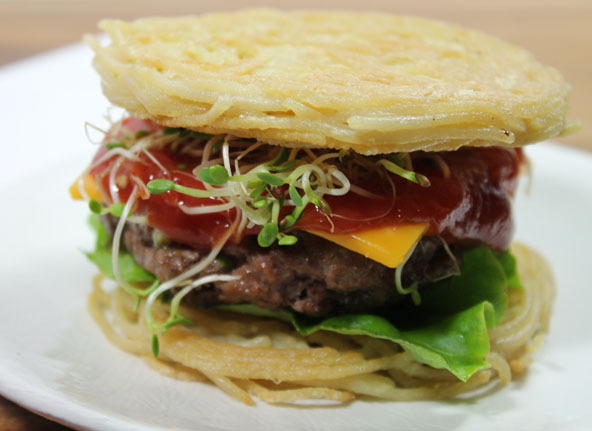 The photos are of Ramen Buns made without arrowroot flour. This was my first attempt at making these. They turned out great but I was trying to think of a way to bind them together a bit more for easier handling. Then I thought of how much we love arrowroot flour in our favorite recipe for chocolate cupcakes and figured it would add a cake like flavor to the Ramen Buns as well as bind them together a tad bit more. It worked nicely but is not essential to the recipe. Note that arrowroot flour happens to also be gluten-free. Boil whole grain spaghetti according to package directions. Don't add salt to the water and don’t break the noodles. (I used to always break the noodles in half because it was easier to eat that way but keeping the noodles long helps it stay together better.) Drain and rinse the spaghetti. In a large mixing bowl, add the eggs, arrowroot flour and salt and whisk together until well incorporated. Add the drained and rinsed spaghetti and stir together until well coated. Coat the moon pie pans with melted ghee or coconut oil. These two oils both harden when chilled so it helps keep the noodles together when transferring to the skillet. Fill the pan indentations with the spaghetti mixture. 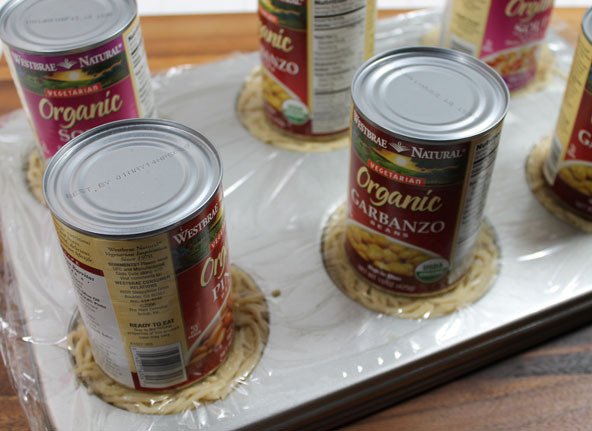 Put a sheet of plastic wrap on top and repeat with the next pan placing that pan on top and repeat. Place the nested pans into the refrigerator for ½ hour or more to set or the freezer for 15-20 minutes. Coat a skillet with ghee and or coconut oil and heat it to medium high heat. Remove the noodle buns from the pan with a rubber spatula and place on the skillet. Be careful not to turn them over before they are cooked enough to hold together well. Once golden brown on the bottom, carefully turn over with a spatula and cook the other side. Remove from the skillet to a plate to await your burgers and desired fixins. This recipe makes 16 so you can store your leftovers for another day for quick use. 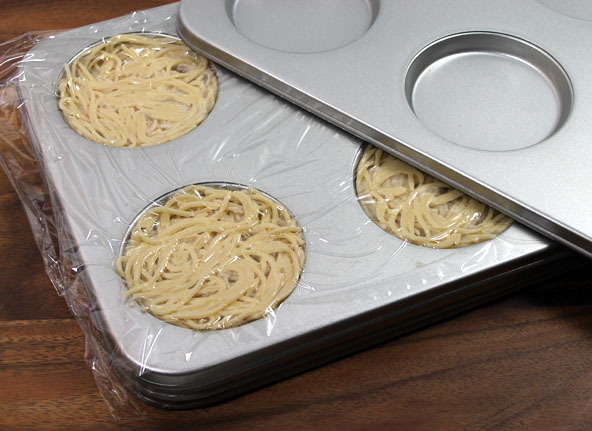 Place parchment or plastic wrap between buns and place in a sealed container either in the refrigerator or freezer. Keizo Shimamoto's famous burger is put together with Ramen buns, beef burger, a special sauce, arugula, cheese, a fried egg and scallions. I can see why the lines can be an hour long to try his unique creation. I used my Tex-Mex Burger recipe, lettuce, ketchup, cheese and sprouts. Wee doggie, them were good! Thank you for this recipe and the hard work you put into it. . I have 100% buckwheat noodles on hand right now and they tend to be sticky . So I’ll give it a go with Asian style turkey burgers and organic hot sauce.